Let’s say you’ve been working with a specific stone, meditating with it, incorporating it into ritual, paying attention to it, listening closely for any messages…and then all of a sudden it breaks. And not because you dropped it on the kitchen floor or because someone accidentally knocked it over. The thing literally broke. Maybe it actually exploded. Why did this happen? And what do I do now? There are many reasons why gemstones break. And there are many responses depending on the way your gemstone broke. The first thing you should know is that stones break for a reason. And it may have nothing to do with you. We are surrounded by toxicity. It’s everywhere. Our gemstones work to bring alignment and balance to our lives, and often they just can’t handle the levels of toxicity which exist in our modern reality. So, they literally become saturated with toxic energy and give out. Know that they gave everything for you and acknowledge them for it. You may bury the fragments if you desire but make sure to give them thanks. Or if you don’t want to part with your favorite stone, you can smudge it with white sage or place it outside in the light of day for it become recharged. Remember that stones can become ‘tired’ if you work with them too often, so pay attention and clean and recharge them as necessary. Do you use your crystals for healing? This makes a significant difference. If your crystal breaks shatter or explode while doing energy work you should not continue using it for healing. The crystal served its purpose and its integrity has been compromised. A gemstone ally that breaks during any kind of healing work has absorbed considerably negative energy. You don’t want to use that crystal for healing again. Keep it around if you wish, but make sure to acknowledge it and give it thanks. Again, use your intuition. If it feels safe to keep it, do so. Otherwise, consider burying it in the Earth. You may even want to plant some roses in the same spot. How beautiful would that be? 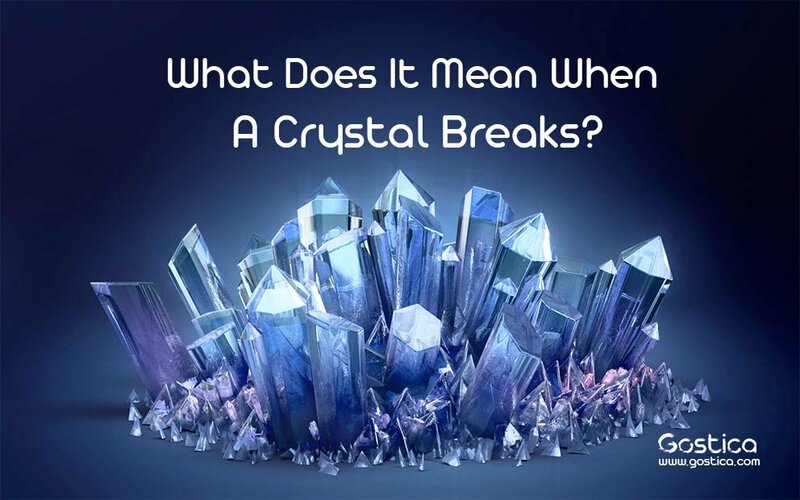 There are a few more reasons why crystals can break. It’s possible that they simply do not resonate with your particular vibration, which is absolutely fine. There are no mistakes, you’re simply being guided to a more appropriate stone. Perhaps your crystal served its purpose and was ready to move on. It’s also possible that you are meant to share that crystal with another who could benefit from its healing properties. Gemstones are meant to be shared after all. When working with gemstones it is important to be clear about your intentions, commit to the hard work, and realize that your gemstone ally is just that—a trustworthy, supportive friend who will lovingly accompany you on your journey, but who cannot do the work for you. Each stone carries its own metaphysical properties. Gemstones emit powerful and unique energetic vibrations that impact how you feel, sense, and interact with your environment. You should select your stones based on their individual properties and align with your specific intentions. Energy work is work after all, and just like in all your romantic endeavors, visual attraction alone will not always get you the results you desire. Simply put, there is no room for superficiality or mediocrity when it comes to energy work. If there is a stone you are immediately drawn to, pay attention. It may be a subconscious realization of an unexpressed need. Don’t ignore your instincts. As you raise your own vibration, you will become more in touch with, and more readily able to use, your own intuition as a guide. Give yourself time, and recognize that energy work is a process and a skill that you can develop and hone over time.